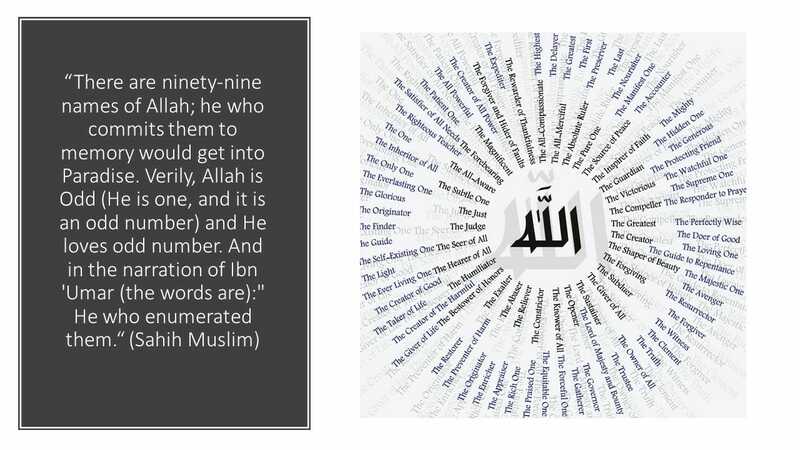 To learn more about the 99 names in Islam, I am learning from Amr Khaled (عمرو خالد). Amr Khaled (عمرو خالد) is a Muslim preacher who has more than 2,000,000 Facebook fans. He has been described as combining “the trendiness of Egyptian pop singer Amr Diab with the down-home missionary appeal of Western televangelist Billy Graham, and the self-help wisdom of popular American TV psychologist Dr. Phil” (Lindsay Wise, “Words from the Heart“). At the end of this post I discuss why some of the sincere beliefs Muslims have about Allah the “One and Only” that are sincerely wrong. 0:00-1:16 In the Name of God, praise be to Him & Peace be upon Prophet Muhammad. Welcome to a new program where we will study one of God’s Names.” “Today, we will study two Names that are instilled deep inside everyone. 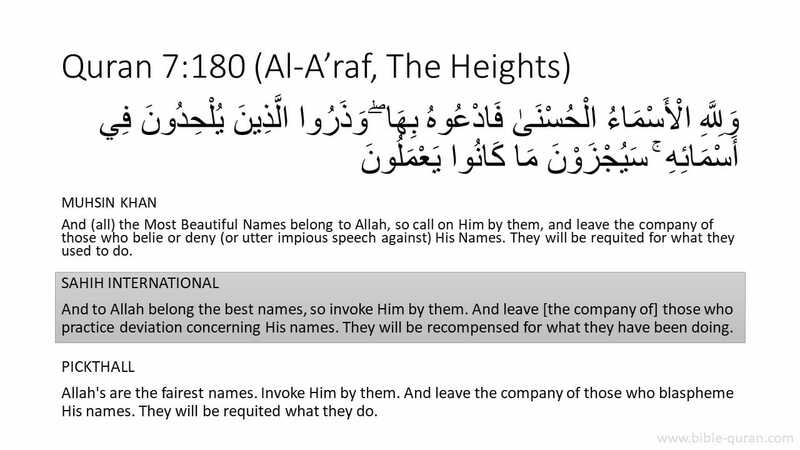 Muslims should live by these two Names of God and one would not be Muslim unless he believes in them. Since creation, everyone knows these two Names of God instinctively. Today we are going to study God’s Names, “The One and Only.” Speaking of God’s Names, “The One and Only” we should define them precisely: these two Names imply God is the One and Ony Lord with no associates; He is the One Who has no rival, partner, or peer for “nothing is like Him; this is the meaning of God’s Names “One and Only. These 2 Names imply God has no partner and nothing is like Him. There is a difference between ‘the One’ and ‘the Only’. ‘The One’ means God has no partner & ‘the Only’ means nothing is lke Him. So “the One and Only” together sum up this great fact: “There is no deity but God!” which is the focal point of today’s program. In which Chapter is this verse found? In “Sincerity of Faith” Chapter. It is called, “Sincerity of Faith” Chapter! This program is challenging; in it we address two different kinds of people. In it, we will talk about basics with polytheists, trying to convince them of the Oneness of God. Also, we will tell the believers that expressing Monotheism with just words repeating: “There is no deity but God” in every Prayer is not enough; every act in their lives and every move they make must express it spelling out devotion to God, the One and Only. Since God is the One and Only, you should be devoted to Him alone, as God says in “Sincerity of Faith”: “He is God, the One and Only…” This is why I believe today’s program is challenging! God help us! I will cite proofs and recite verses that are quite logical trying to convince polytheists taht there is no deity but God. At the same time, I will tell the believers who believe in the Oneness of God they should not only testify there is no deity but God with their tongues, but also with their hearts, eyes and limbs acting upon it sincerely. While I am addressing polytheists, keep repeating: “There is no deity but God’ so your souls and lives may be rejuvenated; these are our goals! By the end of today’s program, I hope to accomplish two things: 1st, proving to polytheists that there is no deity but God; those with sound minds will have no problem believing this. 2nd, convincing the believers to devote their entire lives to God. You should devote your lives to God and worship no one other than Him dedicating all your acts in life to winning the pleasures of God. Live, think, work, marry, procreate and use your money just to please God! You can enjoy worldly pleasures, but with the intent of pleasing God! So we are tackling a very serious topic. So let’s begin studying God’s Names, ‘The One and Only’. I’ll start by addressing the polytheists and reasoning with them. Let’s think about the Signs proving God’s Oneness. I will discuss the great proofs of God’s Oneness and cite related examples. I will mention the six major proofs of the Oneness of God one by one….Let me tell the polytheists of the first proof of the Oneness of God. I will cite proofs and recite verses that are quite logical but theirs is not a firm belief and they can easily be caused to have doubts. So, I am also addressing those young Muslims whose belief in Monotheism can easily be shaken by skeptics. The first proof of the Oneness of God is that all creatures are created in the same manner. What does this mean? All creatures are created in the same manner; a male impregnates a female so a new creature will come to life. Humans, animals and plants all reproduce in the same way and there is no other form of reproduction. How amazing! A man’s sperm that fertilizes an egg in a woman’s womb can be enough to produce an embryo. A male animal’s sperm fertilizes the egg in a female animals’w womb to reproduce. Similarly, when a drop of rain falls on the earth, it may cause seeds to grow! ‘The Night-Visitor’ Chapter highlights this point: “So let Mankind reflect on what he is created, (Mankind) was created of a liquid poured out. It issues (as a result) of the conjunction of the sexual area of the man and sexual area of the woman.” God says in the next verses “By the sky that returns the rain: And the earth ever growing with vegetation.” One drop of rain that falls on the earth can be enough to cause seeds to grow. Let me tell you something amazing: during the first weeks of development, human embryos and animal embryos are said to be nearly identical. There is something even more amazing, it is said all creatures have almost the same body systems, take for example the respiratory system. Almost all creatures have respiratory systems, have skin and have eyes. This can only indicate that there is only One Creator. Had there been 2 creators, each would have had his own style. In order to show their creativity, each would have created creatures a very different way from the other! Amr Khaled’s second proof for God’s Oneness: God’s Universe runs by fixed norms. Part 2 of Amr Khaled (عمرو خالد) teaching on the most beautiful names, the One and Only. The Sun rises small in the sky every morning and then it gets bigger until it reaches the center of the sky and then it starts setting until it disappears. God says, “And for the moon we have appointed phases until she returns like an old (Orjoon).” ‘Old Orjoon’ in Arabic refers to an old palm-tree. Look at the moon when it rises and when it sets bearing in mind this verse: “…like an old palm-tree (Orgoon).” This implies palm-trees grow older as well. As for people, God says: “God is the One Who created you from weakness, then He gave you strength after weakness, then he ordained you for weakness and old age after strength…”Had there been two deities, one of them could have willed Man to be old, then get younger for example! So, there is no deity but God, controlling the Universe through fixed norms. The norm of gradation in the Universe is a proof of the Oneness of God. Nothing in the Universe appears or disappears out of nowhere, the dawn does not break suddenly. God says: “And by the dawn as it starts to breathe…” The dawn breaks gradually! “And by the night as it comes darkening on…” The sun rises step by step, pregnancy lasts 9 months; heaven and earth were created in 6 days. So everything in the Universe happens gradually! “The building of the tower of Babel has also been ascribed to Nimrod; he wanted to see Abraham’s God, a parallel to Pharaoh’s high palace built for the same purpose (Quran 28:38). Nimrod’s tower was destroyed by a heavy storm: “God took their structures from their foundations” (Quran 16:26). As a result, human language was confused. Another version says that Nimrod erected a high building to look down on Abraham in the furnace. The high building sometimes is said to be the pyramids. In fact, the names Pharaoh and Nimrod are exchangeable. Nimrod even went so far as trying to kill Abraham’s God: He rose to the sky in a chest lifted by eagles and fancied that he had killed God when the arrow he had shot returned smeared with blood. His death was as painful as that of Titus the conqueror of Jerusalem as told in the Talmud (Gittin 56b): a gnat penetrated into his brain, tormenting him for four hundred years, the same length of time he had ruled as an ungodly king” (Heribert Busse “Nimrod.” Encyclopaedia of the Qurʾān. General Editor: Jane Dammen McAuliffe . Brill (Leiden and Boston), 2005. CD-ROM version). In a later episode, Amr Khalid says that by sincerely acting on the words “There is no deity but God” – a Muslims deeds can outweigh all his sins. This is untrue. This kind of belief will only add to the burden of one’s sin because no mere man can sincerely act on these words perfectly and perpetually. Islam denies Jesus’ good work in sacrificially dying on the cross. Islam denies God’s good work in raising Jesus from the dead. Muslims often deny the goodness of God’s Word by calling the Bible “corrupt”. Muslims say they believe in the “One and Only” but they do not believe in the monotheism revealed by the One and Only. It is a great sin to deny God. It is an even greater sin to think that God will deny Himself by ignoring His perfect purity and justice in order to let those who are not perfectly pure, just, and obedient into heaven. 2Muslims say they believe in Allah the One and Only. However, they must hope that God will judge in a manner that is not in accord with His Oneness. Jesus taught that loving God will all our heart, soul, and mind is the first and greatest of the commandments (Matthew 22:37-38). You must love God for yourself and with your own mind. 2. ↥ Muslims say they believe in Allah the One and Only. However, they must hope that God will judge in a manner that is not in accord with His Oneness.